Those of you that have followed me for a while now know that breakfast on the weekends at our place is kind of a big deal. My kids and I like to work (more like play!) to together and make something extra special to eat on our lazy weekend mornings. Some of our favorite, go-to family recipes are homemade cinnamon rolls, biscuits, waffles and pancakes! Yes, it's basically a total carb fest here on Saturday and Sunday and we love it! 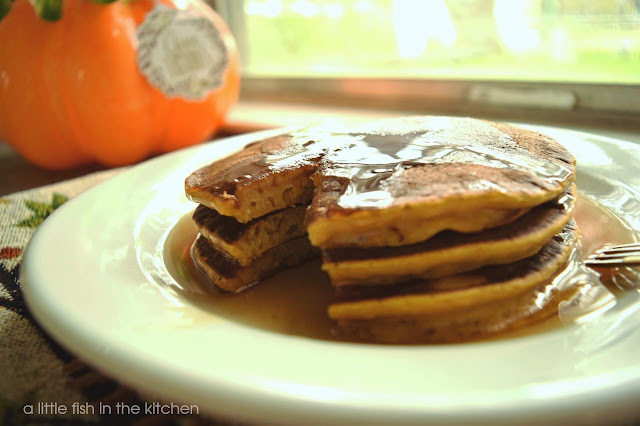 Recently, a new love has entered into our weekend breakfast-party rotation... pumpkin pancakes! Now, I know we are really late to the pumpkin pancake party, but believe me we are here to stay. These pumpkin-packed pancakes are a terrific breakfast treat as they are fluffy and flavorful...and pretty healthy too. 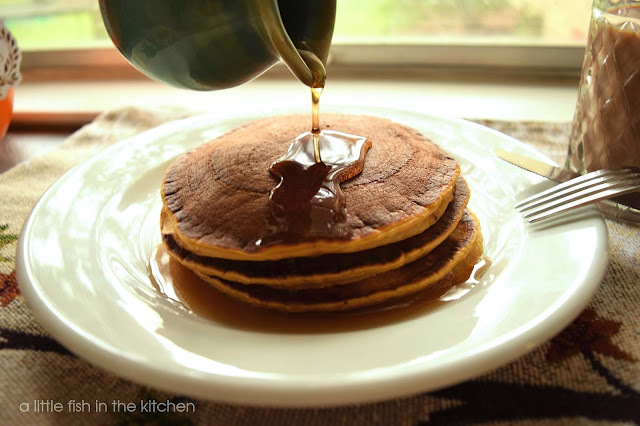 Each time I serve these amber-colored pancakes, my kids are immediately focused on the rich flavor of the warm spices and a healthy drizzle of maple syrup. But, I'm also immediately happy to watch them gobble these pancake stacks up. 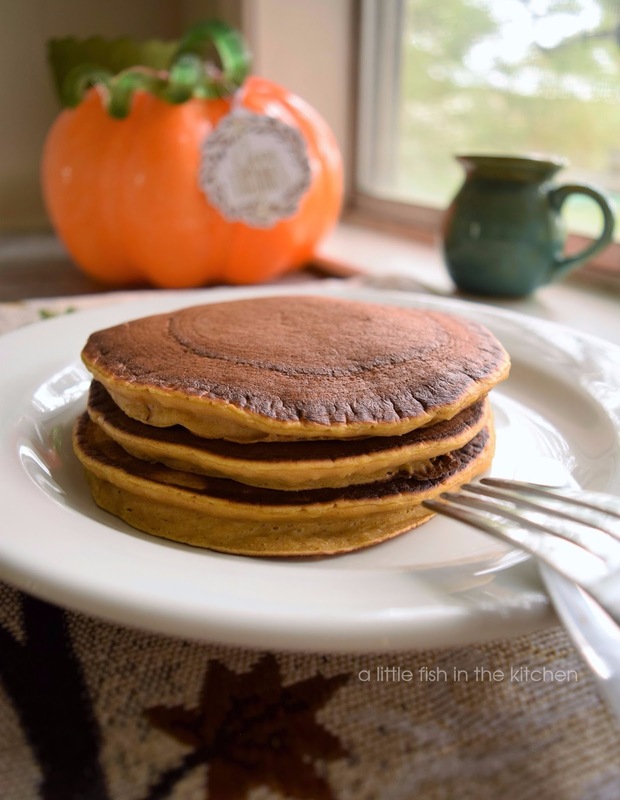 All of that pretty pumpkin puree they're consuming, in pancake form, is loaded with essential vitamins like A and C as well as iron and fiber too! 1. Melt the butter in a small bowl and set it aside so it can cool slightly. Next, in a medium-size bowl combine the flour, spices, baking powder and sugars. Set the bowl with dry ingredients aside. 2. Combine pumpkin puree, beaten eggs, milk, butter. Make a well in the center of the dry ingredients and pour in the pumpkin mixture. Use a wooden spoon to mix batter until it is just combined. Be careful not to over mix the batter! 4.Cover pancakes with a kitchen towel to help keep them warm until all pancakes are done. Serve with maple syrup or fresh fruit and whipped cream and enjoy! This reminds me that I still haven't had pancakes in a while! These look very soft and tasty, Marcella. Very tasty! I added a dash of cloves, too - like pumpkin pie for breakfast! Hmmm... I might just have half a can of pumpkin purée in the fridge after making some pumpkin Crème brûlée (from Inger's site - do you know her?). I am sure it will last till Friday (a holiday!!!). And we have the best New England maple syrup, too! I hope you like them, David. It's a good, seasonal change of pace from traditional buttermilk pancakes. :) Thank you! Pumpkin pancakes are the bomb! Just had some at the pancake house up the street. I can't wait to try yours! Love pancakes, but have never made pumpkin ones for some reason! Gotta try this -- looks excellent. Thanks! These pumpkin pancakes look exceptional Marcelle. How wonderful to spend your weekends making breakfast together with your family. Now that my kids are grown I miss that very much. I would love to try these soon, Marcelle. They do sound delicious and healthy too! I am a huge pancake and pumpkin fan! Always a winning combination. Marcelle, these look fantastic! We never have pancakes for breakfast, even on the weekends, but we love to have them for dinner occasionally. I'll have to give these a try some evening!